Flagstaff Lake, looking northwest to the Bigelow Range. The name “sugarloaf” comes from the way sugar was sold in the early and mid 19th century. It didn’t come neatly packaged in bags or boxes like today, but tightly packed in a cone shaped container. It was one solid hunk of sugar that sat like a mini-mountain on the kitchen table or in the pantry. Users would cut off what they needed. Sugarloaf Mountain, in the remote Maine’s Lakes & Mountain Region, has the same conical shape. At 4,250 feet, this is Maine’s second tallest mountain, bested only by Mt. Katahdin. That is one enormous pile of sugar, or in this case white, powdery, ski-tempting snow. In the spring the mountain shakes off its white blanket, exchanging it for new buds and the green that will last until fall. Visitors break out the mountain bikes, ATVs, camping and fishing gear. A few short months later the cameras come out to capture the blazing colors of fall. This outdoor playground, as well as the nearby Rangeley, Farmington and The Forks areas, welcomes nature lovers the year round. Looking at the expanse of Sugarloaf Ski Resort, with its many trails and lifts, it is hard to imagine that the founders of this ski resort had to walk three miles before they could even start skiing. Winters Way, still in use today, was the first trail carved in 1950 by Amos Winter and a group called the Bigelow Boys. The first race on the mountain was in 1952, a full year before the first tow rope went in. Today the Sugarloaf Ski Resort and the Carrabasset Valley area attract visitors year round. In winter they come to ski, snowboard, go tubing and indulge in fireside chats in their rented condos or other overnight spots such as the Sugarloaf Mountain Hotel. In April spring skiing is combined with the annual Reggae Festival, listed in SKI Magazine as one of North America’s top spring festivals. Summer brings golfers eager to challenge the greens at the Sugarloaf Golf Club. Mountain bikers and hikers take to the back-country, perhaps taking a scenic ride in one of the resort’s lifts or gondolas. Fly through the forest on a heart-stopping zipline, winter or summer. The latter part of May brings the Sugarloaf Marathon, a qualifier for the Boston Marathon. The race covers some challenging terrain as it makes its way from Eustis in the north to the finish at Kingfield. July brings the annual Healthcare Golf Classic and the Carrabassett Backcountry Cycle Challenge. 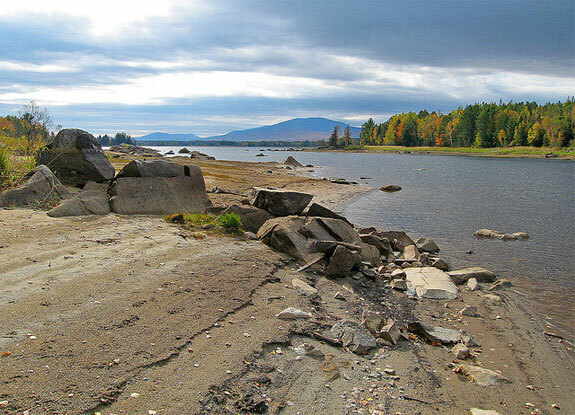 Just north of Sugarloaf Mountain is the 10,540-acre Bigelow Preserve that includes Flagstaff Lake. Nearly 23 miles of wilderness hiking trails criss-cross the area, including part of the Appalachian Trail. Primitive campsites are found below the tree-line. Cross-country skiing, snowmobiling and mountain biking are allowed on designated paths. Kayaking, canoeing and seasonal fishing are also available. Two of the most scenic highways in Maine, Routes 16 and 27, skirt the western edge of the preserve. The moose population in this area is healthy and prolific. You are almost guaranteed to find one, or more, within the preserve or along these highways. The park is east of the Rangeley Lakes region, more moose-friendly territory. Bordering the western edge of the Bigelow Preserve is the village of Eustis and the slightly larger town of Stratton. Route 27 runs through the area, on the way to the Canadian border and the Coburn Gore crossing into the province of Quebec. In 1775 Benedict Arnold led his army through what would become Eustis on the way to fight in the Battle of Quebec at Dead River. The Dead River Area Historical Society houses memorabilia from this war, the town of Flagstaff and the one-time Eustis Plantation. The Arnold Trail is a popular snowmobile venue. Also on the way to the Quebec border is the Chain of Ponds Public Reserved Lands, near Route 27. Four ponds, the Lower, Bag, Long and Natanis are connected by small waterways, almost like beads on a necklace chain. It is possible to paddle the entire chain, stopping to camp along the riverbank in true back-to-nature fashion. If you are looking for more amenities, the Natanis Point Campground is on the northern end of the Chain of Ponds, six miles from the Canadian border. This campground accepts tents and RVs. It offers a sandy swimming/sunning beach, fishing, playground, game courts, restrooms, showers and a camp general store. Some camp sites are waterfront. Roughly 35 miles of the Dead River is part of the Northern Forest Canoe Trail, a 740-mile long marked trail that reaches from Old Forge to Fort Kent, Maine. The Dead River portion leads to Spencer Stream, coming out just below Grand Falls. Dead River is knows for its whitewater rapids, some reaching Class 4. The 15 mile stretch from Spencer Stream to West Forks is particularly challenging. The Cathedral Pines Campground, on the shores of Flagstaff Lake, offers camping for tents and RVs, canoe and kayak rentals, a swimming beach and other camp services onsite. This is one campground that is really in the middle of moose-friendly nowhere but still offers Internet access. Tim Pond Camps, near Eustis on Tim Pond, is a sporting camp offering a fly-fishing school, cabin rentals, fishing and hunting packages. Each February, in Eustis, snowmobilers gather for the four day Polar Blast festival, one of the largest snowmobile gatherings in the state. At the end of June, at Flagstaff Lake in Stratton, is Family Fun Days, including a parade, fireworks, golf tournament, canoe and kayak races, Classic Car Show, music and bouncy toys for the kids. In October, the Fall Harvest Festival offers a chance to dress up like a scarecrow, decorate a pumpkin or take part in the Moose Meadows Golf Tournament. The White Wolf Inn makes a rustically comfortable overnight stop for your Sugarloaf adventure. The onsite restaurant, which made the pages of Downeast Maine magazine, offers a number of interesting Maine-influenced meals, including the “Wolfburger.” Trailheads to the Appalachian Trail are found in Stratton, off Route 27. The Crocker Cirque, a glacially formed basin on Crocker Mountain west of Sugarloaf, is another draw for hikers and snowshoers, reachable by the Appalachian Trail. Another draw is the Moose Loop ATV trail. As the name implies, it is possible to see some of these big guys as you motor about. Amos Winter, the brains behind Sugarloaf Ski Resort, was a storekeeper in Kingfield. The Sugarloaf Mountain Ski Development started here, which led to the creation of Maine’s premier ski destination. Long before that Kingfield was an agricultural area, producing crops such as wheat, corn and potatoes. A sawmill built on the Carrabasset River also added to the town’s productivity. William King, Maine’s first governor, Stanley Steamer, the builder of the first steam automobile and his twin brother Francis Edgar, creator of the Stanley Dry Plate, the precursor to camera film, all were early residents of Kingfield. The Stanley Museum, housed in the old Stanley School, circa 1903, houses examples of the cars, photo equipment and other memorabilia. The Ski Museum of Maine delves into the history of skiing in Maine and some of the personalities that have contributed to the sport’s success. Kingfield is home base to Maine Huts and Trails, an organization that manages 45 miles of back-country trails suitable for hiking, mountain biking, snowshoeing or cross-country skiing. Three lodges are set along the trails, each about a day’s travel from the other. Called huts, they are full service lodges with meal service, hot showers and beds. The idea is to get out and explore the Maine wilderness while enjoying basic creature comforts. Winter visitors come to ply their snowmobiles along the Black Fly Loop or to snowshoe amid the Bigelow Mountains. Spring and summer offers camping, swimming in the Carrabassett River, hiking, boating and fishing. The town is south of the Bigelow Preserve, Sugarloaf Ski Resort and the Sugarloaf Regional Airport. The Deer Farm Camps & Campground offer tent and RV campsites as well as rustic cabins for rent. Tuft’s Pond, Grindstone Pond and Shiloh Pond all offer canoeing, swimming and fishing opportunities. Each June, the Kingfield POPS music festival is held at the Kennedy Farm in Kingfield, featuring everything from bluegrass music to the Bangor Symphony Orchestra. The Free Arts Festival is also a June event, held in downtown Kingfield, offering food, local art and craft works and even more music. Sitting south of Kingfield along Route 27 is New Portland. The Carrabassett River flows through the western edge of the township, and in places offers challenging rapids. The Wire Bridge, one of the oldest suspension structures in the United States spans the Carrabasset in West New Portland. Built in 1812, the bridge has had several refits and is still in use today. The Gilman Stream, a quieter waterway, offers a gentler canoeing or kayaking experience. Both rivers are visited regularly by the local moose population. New Portland is also home to the Nowetah’s American Indian Museum, featuring Native American artifacts and an onsite store selling newly made Indian crafts. The government of Massachusetts deeded the land for New Portland to residents of Falmouth, which would become Portland, after it was destroyed by the British in 1775. Veterans of the Revolutionary War were the first settlers, mostly in what is now East New Portland. Today the town is made up of three separate villages, North, East and West New Portland. The Seven Falls Cabins are on a bluff fronting the Carrabassett River, near the Wire Bridge. Hidden within the forest, these rustic cabins are named for waterfalls in the Carrabassett Valley. Most cabins share a shower house and bathroom, but two do have private bathrooms. The cabins are a 20 minute drive from downhill skiing at Sugarloaf, but snowshoeing and cross-country ski trails are just outside your door. In the summer take to those same trails with your hiking boots on, picking and munching blueberries as you enjoy the scenery. Visit the following directories to find lodging, dining, attractions, shops, services and recreational activities in the Carrabassett Valley, Maine area.